My textbook Basic Category Theory, published by Cambridge University Press, is now also available free as arXiv:1612.09375. And it’s not only free, it’s freely editable. The book’s released under a Creative Commons licence that allows you to edit and redistribute it, just as long as you state the authorship accurately, don’t use it for commercial purposes, and preserve the licence. Click the link for details. Why might you want to edit it? Well, maybe you want to use it to teach a category theory course, but none of your students have taken topology, so you’d rather remove all the topological examples. That’s easy to do. Or maybe you want to add some examples, or remove whole sections. Or it could just be that you can’t stand some of the notation, in which case all you need to do is change some macros. All easy. Alternatively, perhaps you’re not planning to teach from it — you just want to read it, but you want to change the formatting so that it’s comfortable to read on your favourite device. Again, this is very easy to do. Emily recently announced the dead-tree debut of her own category theory textbook, published by Dover. She did it the other way round from me: the online edition came first, then the paper version. (I also did it that way round for my first book.) But the deal I had with Cambridge was that they’d publish first, then I could put it on the arXiv under a Creative Commons licence 18 months later. We’ve talked a lot on this blog about parasitic academic publishers, so I’d like to emphasize here what a positive contribution Cambridge University Press has made, and is continuing to make, to the academic community. CUP is a part of Cambridge University, and I think I’m right in saying that it’s not allowed to make a profit. (Correction: I was wrong. However, maximizing profits is not CUP’s principal aim.) It has led the way in allowing mathematics authors to post free versions of their books online. For instance, apart from my own two books, you quite likely know of Allen Hatcher’s very successful book Algebraic Topology, also published in paper form by CUP and, with their permission, available free online. Since a few people have asked me privately for opinions on publishers, I’ll also say that working with CUP for this book was extremely smooth. The contract (including the arXiv release) was easily arranged, and the whole production process was about as low-stress as I can imagine it being. This wasn’t the case for my first book in 2003, also with CUP, which because of editing/production problems was a nightmare of stress. That made me very reluctant to go with CUP again, but I’m really glad that I chose to do so. The low stress this time was partly because of one key request that I made at the beginning: we agreed that I would not share the Latex files with anyone at CUP. Thus, all I ever sent CUP was the PDF, and no one except me had ever seen my Latex source until the arXiv release just now. What that meant was that all changes, down to the comma, had to go through me. For example, the way the proofreading worked was that the proofreader would send me corrections and suggestions and I’d implement them, rather than him making changes first and me approving or reverting them second. For anyone with a perfectionist/pedantic/… streak like mine (insert your own word), that’s an enormous stress relief. I’d recommend it to any authors of a similar personality. Again, it’s to CUP’s credit that they agreed to doing things this way — I’m not sure that all publishers would. So the book’s now free to all. If you make heavy use of it and can afford to do so, I hope you’ll reciprocate the support that CUP has shown the mathematical community by buying a copy. But in any case, I hope you enjoy it. Hooray and congratulations! That’s amazing that CUP agreed to let you do all the LaTeXing. Given my experiences with copyeditors for short journal articles, I can imagine the hell that it would be to deal with them fubaring my LaTeX for an entire book. What would you say the advantages are, for an academic book, of using a “real” publisher like CUP over self-publishing with a place like Lulu? The latter has worked fine for the HoTT book, with the additional advantage that as we receive errata we can easily fix them not only in the online version but also in all newly printed copies (I’m guessing that that still isn’t possible with a place like CUP, although it would be great if I were wrong). I suppose that CUP will do more publicity for you, and maybe libraries are more likely to buy from a real publishing house? Thanks! Of course, it’s hard for me to compare CUP with anyone else because I’ve never published with anyone else. From what you say, Lulu has optimal error-correcting features. CUP does do printing on demand — e.g. when I ordered a copy of Adámek and Rosický a few years ago, it was printed as a one-off. So perhaps I could send CUP a corrected version of my PDF and they’d use it for future printings. The errors spotted so far are minor enough that it doesn’t enormously concern me, but it would be interesting to know for general reasons. If we’re really lucky, someone from CUP will read this and tell us. I haven’t kept a close eye on sales figures, but my impression is that library sales do make up a large proportion (if I had to guess, 50%). Maybe some libraries buy everything in certain series? I don’t know. I guess something else to consider is peer review. This is not much of a problem for a textbook on a well-established subject like yours, but for a research monograph (I mean a book containing original research) it’s more of a concern. By now the HoTT book has probably been read by multiple people more closely than many referees would read a book, so although it started out with a lot of errors (it was written by a lot of people in a short span of time) a lot of them have been fixed already (I hesitate to say “most”, but the rate of error-finding has decreased dramatically). However, it’s a bit of a special case in that it got a lot of publicity even outside those established in the field and has been used by many people trying to learn about the subject; an arbitrary self-published research book would probably not get read as closely as quickly. However, I must admit my total ignorance of how (whether?) research monographs published by ordinary publishers are peer-reviewed. Reading an entire book as closely as a referee reads (or ought to read) a research paper is a tall order; do they find people to do it? I think once someone from a publisher asked me to referee a book, but I turned it down so I don’t remember the details; possibly they offered me some free books in return. Is this standard? My experience is that publishers such as CUP and the AMS send book proposals to anywhere between one and three reviewers. The proposals I’ve seen have most often been close-to-finished full manuscripts, but sometimes they’re as little as a list of section headings and a couple of sample chapters. I definitely don’t think it’s expected that reviewers read the whole thing in detail or apply the same standards that they would to a research paper. At least, I hope not, because I’ve reviewed book proposals and not done that! I believe what the publishers really want to know is whether it’s good quality stuff and what the likely market is. Plus it’s an opportunity to try to transmit helpful comments on the book. For instance, even though my textbook is on very well-established stuff, I got useful comments from the reviewers that I believe helped to improve the finished product. We published a book with Springer that had five referees. Certainly some were more thorough than others, and some seemed to focus on different parts of the text. One in particular engaged quite deeply, but not with the whole book. I don’t think that anyone wrote a review that seemed like six-ten times what a normal paper review would be. I think a lot of it depends on the series and / or publisher. There’s a bit of discussion going on over at hacker news. This short introduction to category theory is for readers with relatively little mathematical background. I confess, I wrote that abstract rather quickly the other day, and I’d already regretted the first half of the sentence: I said “short”, but I didn’t mention that the thing’s actually a book. And now that we’re talking about the second half of the sentence, I concede that the word “relatively” is carrying a lot of weight. If I revise the arXiv submission, I should make the prerequisites more explicit. I’ve had a similar issue with the blurb to my book. It hadn’t occurred to me that it would attract interest from a broader audience of mathematical enthusiasts - see for instance this Amazon reviewer - who have not experienced the indoctrination provided by a university-level abstract algebra course. The lesson that I’ve taken away from this is an auspicious one: there is an opportunity for category theory to be a part of much wider conversation than I’d previously realized, assuming we’re up to the challenging of making ourselves intelligible to those who don’t yet speak the language that we’ve internalized. I’ve been hawking both your books to my vast horde of followers on Google+, so that may account for a few people who dive into them without adequate preparation. But as you say, it’s basically a good problem to have. I find that there are a lot of economists, biologists, psychologists, music theorists etc. who get excited about the power of category theory and have to be warned that it won’t magically solve their problems for them: in fact, it takes quite a lot of skill to wield it to advantage, especially in areas outside pure math. On occasion I’ve looked at online reviews of math textbooks (from just-beyond-calculus undergraduate level through beginning graduate level) on Amazon and similar sites, and found that most of the reviews are not written by any of the audiences for which the books are mostly written: instructors teaching from them (or using them as supplemental resources for teaching), students taking classes based on them, or more advanced mathematics students or mathematicians using them as a reference. Instead, the reviews tend to be written by the kind of people participating in that hacker news discussion: people to whom Tom’s “relatively little mathematical background” appears quite substantial, who are looking for resources for independent self-study. And of course those readers judge the books by their usefulness for that purpose. I don’t really know what the goals and motivations of these readers are; presumably they vary a lot from case to case. But I imagine it’s a rather under-served market. I expected there would be more complaints that Tom didn’t include categorical example of things they are more familiar with such as logic and data structure like things (partial orders, monoids, graphs). Steve Awodey’s book Category Theory gives better coverage of those topics. Maybe someone could edit Tom’s book to include a lot of CS examples. One possible reason for that is that I did include partial orders and monoids. They’re all over the place in my book. Just look at the index entries. those are only slightly similar. They are PDFs that are free to download. Their only difference from all other free PDFs on the web is that they have been approved by the AMS. Tom also provides the source to his book and permission to modify it to create new versions. As a graduate student with an interest in category theory, I’ve been following this blog silently for a while, but I’m going to pipe up here to make a minor criticism - I would like to point out that using the NC clause is generally not as good an idea as it sounds at first. Licensing it as sharealike (as you have done) does most of the heavy lifting for you, and the noncommercial licenses exclude a lot of derivative works which you normally would like to allow. A good summary of this can be found at freedomdefined.org. That said, I really appreciate the decision to give this a CC license at all, it’s fantastic that CUP agreed to that! David Roberts brought up the “noncommercial” aspect a while ago, making objections that I think were similar to those in your link. I don’t have a strong opinion. The noncommercial clause was requested by CUP, and that seemed natural to me: otherwise another publisher could simply take my text, bind it and sell it in competition with CUP. I once thought that way too. But I’ve since realized that it’s a little more subtle than that. There are strong reasons for allowing commercial use of free software, as the GPL does. However, not all of those reasons apply to books and other creative works. For one thing, it’s a lot harder to make a living off of free-as-in-beer books by selling technical support. Also, the mutual incompatibility of CC-SA and CC-NC-SA is cited as one of the reasons to choose SA. But actually, it cuts both ways: if you want to participate in a sharing ecosystem where the majority of people are using CC-NC-SA (some of them perhaps because it was requested by a publisher, as Tom mentions), then you have to use NC too. Another problem is that all the CC-SA licenses appear to be somewhat broken (relative to, say, the GFDL, although that is arguably broken in its own way) in not requiring redistribution of an editable form. As far as I can tell, with a CC-BY-SA license it would be perfectly legal for someone else to take the LaTeX source, modify it, and release the compiled PDFs of their modified version but not their modified LaTeX source, which arguably defeats the whole purpose of “Share-Alike”. A NC doesn’t really address this problem, but it does remove any financial incentive for abusing the spirit of the licence in such a way. That’s a pretty significant problem! I’m embarrassed to admit I wasn’t even aware. I’m genuinely interested to know, is the GDFL the best option available for copylefting the LaTeX code itself? 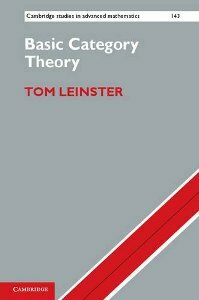 In my opinion and based on personal experience, Basic Category Theory is the ideal text for self-study by a mathematics undergraduate or masters student. I taught an undergraduate independent study using this text when it was still in manuscript form - though “taught” might be too strong a word to use. My student read a few sections of Basic Category Theory each week, and then came to me to explain what she had learned. Only rarely did I have to “teach” her anything she hadn’t already learned for herself by reading Tom’s book. It’s fantastic that it’s now freely-editable. I could imagine an expositorily-minded student getting a kick out of annotating the book as they work their way through it. I prefer this book as a guide toward the universe of category theory. It is written according to a philosophical pedagogy. As an ex-maths, ex-physics student I have to say that everything I’ve learnt about category theory has been through this site and related (like Nlab). It’s really too bad I didn’t come across it when I did my undergraduate degree; it would have made it more comprehensible, and more interesting.